Back in May, I put together an awesome Weight Watchers Dessert Recipe for a super fabulous blog, It Sux to Be Fat. If you haven’t ever had a chance to read her blog, Jennifer Swafford provides an open and honest dialogue there that covers Weight Loss, Exercise, Recipes, and Nutrition. And she does it in a away that makes you feel like you are talking to your best friend, rather than some super skinny weight loss authority. Jennifer has lost 100 lbs with Weight Watchers and her story, advice, and support are a great asset to anyone trying to lose weight, so I highly suggest checking out her blog! Made with a standard cake box mix, and a few healthier substitutions, these cupcakes will rock your world! They make a fantastic summer dessert recipe to bring to a potluck or BBQ, so if you need an idea for a Weight Watchers 4th of July Recipe, this would make an awesome one. Enjoy! Light, moist, and delicious, these low calorie cupcakes are the perfect summer treat. Made with a whipped cream frosting and a standard cake box mix, with some healthy substitutions. Preheat oven to 350. Line 24 muffin/cupcake cups with paper liners. In a medium sized mixing bowl, combine cake mix, water, applesauce, lemon zest and 1 tbsp of the sugar free lemonade mix. Spoon batter evenly into cupcake cups. Bake until a toothpick inserted into the center comes out clean, about 17 minutes. Transfer cupcakes immediately to a rack to cool. 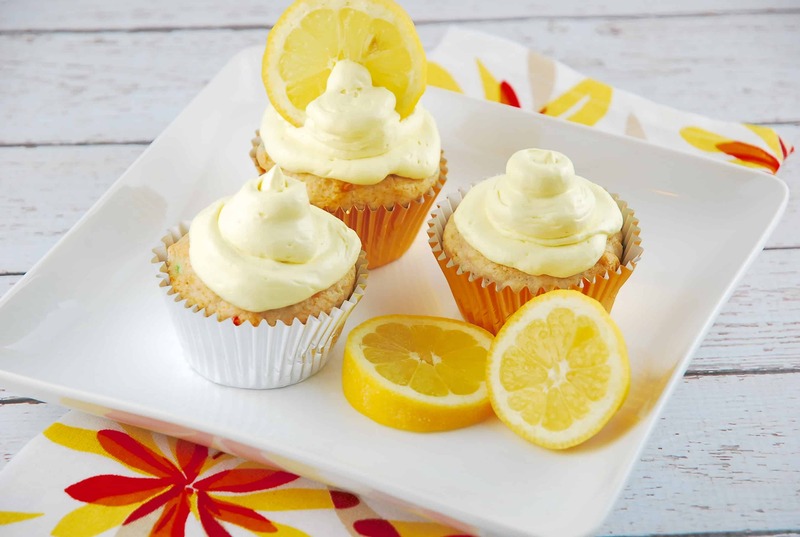 While cupcakes are cooling, make frosting by combining the whipped topping, and remaining 1/2 tbsp sugar free lemonade mix. Once cupcakes are completely cool, top with frosting and serve. These sound great. I am confused as to how many this makes. Recipe says to prepare 24 muffin cups but servings say 12. Would like to make these for tomorrow’s celebration. These sound (and look) good. I will have to try them. Thanks!